Photograph by David J. Liddle who kindly granted me permission to use it. Several years ago, I was given a set of photographs (photomicrographs) of the various flower parts of a hoya of Hoya solaniflora, mislabeled as “sp. PNG-4. The photographs were taken by a man that I then assumed to be a careful researcher. He had labeled these Hoya solaniflora pictures as “PNG-4.” I have since learned that the entire set of pictures was mislabeled. I was correct in identifying that set of pictures as Hoya solaniflora but entirely wrong in my assuming that the hoya known as PNG-4 had been the subject of that gentleman’s photographs. Thinking the pictures correctly labeled I determined that PNG-4 was Hoya solaniflora. I was wrong! I am sincerely sorry for having mislead everyone into thinking that PNG-4 was Hoya solaniflora. It is not. Please pass the word to all who may have a PNG-4 with a Hoya solaniflora label on it. Liddle’s number for Hoya solaniflora is IML-1085, however, David says that he lost this one. Apparently, Kloppenburg has it (or had it) mislabeled as PNG-4. If you have a hoya labeled PNG-4 and its blooms are creamy white (instead of deep maroon red) and its corona scales are broadly rounded (instead of pointed) at their outer apexes, Hoya solaniflora is most likely what you have. If your flowers are deep maroon red and the corona lobes more or less pointed then you most likely have PNG-4 which still has not been correctly identified. Letter #1: I purchased a hoya named Hoya palawanica and someone told me that you said it is an imposter. Is that true? If so, prove it. I got my plant from Mr. Kloppenburg before he went out of business. Since he named the plant, surely he knows what it – A Heckler (unsigned)! Reply: Okay. I assume that you have a hoya with rather thin, tri-nerved leaves on rather thin stalks and branches. Correct? If so the leaf petioles on your plant are quite slender, just as the stems from which they arise. Hoya palawanica is a very thick leafed plant with petioles that are extremely stout, often much thicker in diameter than the branches from which they arise. Leaf venation is pinnate and anastomosing (see below). On the type specimen they appear to be very conspicuous but since I’ve only seen this single dried specimen I’m in no position to say it they are conspicuous on living plants. See below. The above is a copy of a typical leaf on the Hoya palawanicia Schltr. ex Kloppenb. holotype specimen. Reply: I am, of course! But don’t take my word for it. Take the words of Robert Wight, George Don, Carl Blume and R. Rintz. Now, as George Bush used to say, “Read my lips!” This is going to be long and a little complicated. I’m tired of repeating it so make a copy and keep it handy. 1826: Dr. Carl Blume published a hoya which he named Hoya macrophylla Blume. 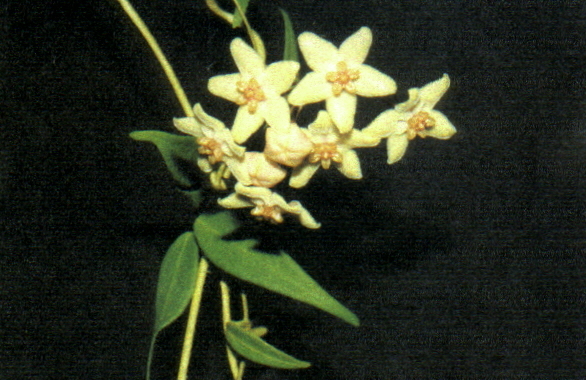 1834: Robert Wight, who obviously did not know about Blume’s publication, published a hoya of a different species, which he named Hoya macrophylla Wight. .
1837: George Don, while translating Robert Wight’s book, Contributions to the Botany of India, recognized that Robert Wight had included in it a hoya with an untenable name, i. e., Hoya macrophylla Wight. He investigated and determined that Wight’s plant was a different species so he republished it, giving it the name of Hoya latifolia G. Don. Wight’s type specimen still exists. It is housed in the herbarium at Cambridge University in England, at least that is where the late Hon. Douglas H. Kent told me he found it. It is in no way like Hoya polystachya Blume other than having tri-nerved leaves. Letter 2 – question 2: So, if you are right and Hoya latifolia and Hoya polystachya are not the same species how did the assumption that they are the same species come about? Count them and I think you’ll see that Rintz cited three type specimens that he had NOT SEEN. He didn’t cite a single specimen that he had seen. I don’t know about you but it seems to me that with Wight’s type specimen so close to where he claims to have researched that there is no excuse for his having “NOT SEEN” it. When the late Hon. Douglas H. Kent went looking for it, he didn’t have any trouble finding it. Note: The upper case and bold print are mine. One of the staunchest supporters of the name Hoya latifolia label on Hoya polystachya Blume is Mr. Ted Green. Not too long ago Mr. Green wrote in a Fraterna article that the best herbarium specimens had drawings attached to them. The Hoya latifolia type specimen at Cambridge has a drawing attached. It is not an elaborate drawing but it certainly proves that Hoya latifolia is a different species than the one in Rintz’s illustration. It also has a flower with the corona removed and mounted. That single corona is as large as an entire flower on Hoya polystachya Blume and of a very different shape. Letter #3: I have read that there is a non-tropical form of Hoya pachyclada. Can you tell me where I can buy one as I’d really like some hoyas that will grow outdoors in Kentucky? Reply: Dream on! There is no such thing. I have repeatedly been misquoted as saying that I have a non-tropical form of Hoya pachyclada. I NEVER SAID THAT. I have been misquoted because they stopped teaching reading the year my class graduated from grammar school. What I said was that I got two different species of hoyas labeled Hoya pachyclada. One first came to me as Perpich #594 and was later identified as Hoya pachyclada. Its leaves are oblong to oblong-obovate, very thick, light grayish green with fuzz all over. The person who identified this one for me said that it very closely matched the type specimen. The other one that came to me labeled Hoya pachyclada came from Mr. Ted Green. He wrote on the label, “NON-TYPICAL FORM.” When I still thought it was probably the same species as the true Hoya pachyclada, I “copy-catted” Mr. Green and labeled it “NON-TYPICAL FORM” in order to differentiate between the two. Now that I know it is an entirely different species, I call it what I know it to be, which is Hoya subquintuplinervis. And, NO, it is not the same species that Mr. Green and others sell mislabeled Hoya subquintuplinervis.